Jamie Wylie (left) and James Irvine (second from right) with staff from the Birnam Arts Centre. A new initiative aiming to tackle plastic use in Perthshire has announced the first business to sign up to its scheme. Plastic Free Perthshire is a project helping businesses and communities in the area reduce the use of single-use plastics. It has produced a guide for businesses which sets out solutions to help reduce the use of plastic straws, takeaway cups and plastic bottles and use environmentally-friendly alternatives. 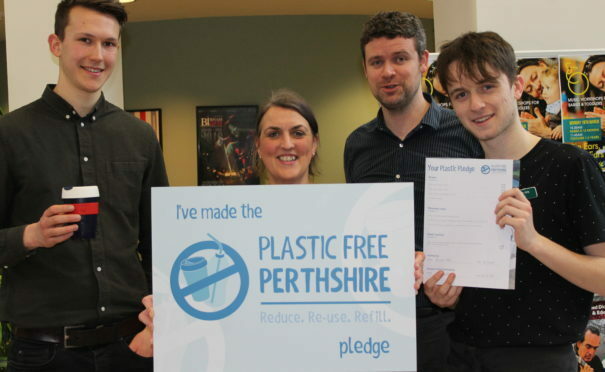 Birnam Arts Centre has become the first business in the county to make the Plastic Free Perthshire pledge. The solutions to be introduced by the Birnam Arts Centre café include the use of paper straws, incentives to encourage customers to use reusable takeaway cups, and signing up to the rapidly-growing ‘Refill’ app to advertise free tap water. The project comes as the Scottish Government seeks to introduce a deposit return scheme for bottles, as well as a possible ban on plastic straws. Perth and Kinross Council will also reduce the use of plastic straws, cups and bottles. Jamie Wylie, founder of Plastic Free Perthshire, said: “The issue of plastic has been on everyone’s minds recently. TV Programmes such as Blue Planet 2 have shown people the scale of the problem that is posed by plastic and the issues that it’s causing. “A healthy environment is one of the foundations of Perthshire’s economy, so taking steps to reduce plastic pollution is vital for our county. He continued: “It’s fantastic that the Birnam Arts Centre has taken the Plastic Free Perthshire pledge. They’ve shown a real commitment to help customers cut back on plastic. Mr Irvine said the arts centre has already started using compostable takeaway cups, providing free tap water and using biodegradable straws. And he revealed the centre will be offering incentives for people to use their own takeaway cups.